Many are touted as real cutters, but few deliver on this expectation. 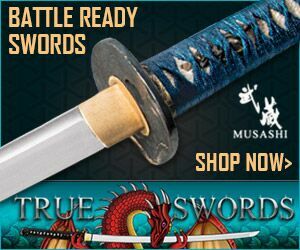 Those that have done well include several Masahiro Katana and more recently the Musashi Wind Dragon Katana (click on the links for the reviews of both of these swords on SBG). For those of you who are not familiar with the term, Shirasaya Katana are Japanese Samurai Swords that are stripped down to the blade and a simple, plain wooden handle (Shirasaya literally means White/plain Scabbard). The Musashi Rosewood Shirasaya belongs to this interesting group of Japanese Samurai Swords, which for modern day non-Yakuza are better off as either REAL Katana for an attractive display or the bare blade for a DIY customisation experiment (and at $59, they are ideal for this purpose!). 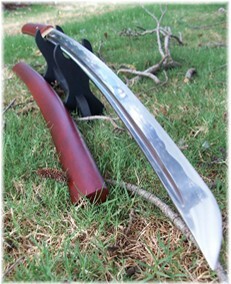 Naturally, being a Shirasaya, it has little in the way of fittings to describe. The rich deep Rosewood finish of the scabbard and handle is very smooth and well finished with a dark natural grain. 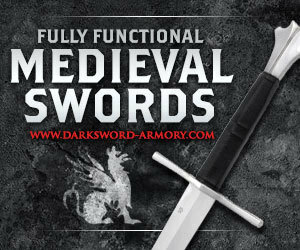 While the marketing materials for this sword claim that no two are alike the one I received had a slightly (1mm) thicker saya than the handle, which disrupted the overall flow along its length a little. But to be fair, its only really noticeable when you inspect it very closely. The only other visible feature of the sheathed sword is a single mekugi peg, which to this swords credit appears to be made of bamboo  a rare feature in Japanese Samurai swords around this price point. But where this sword really shines (pardon the pun) is when the blade is drawn. 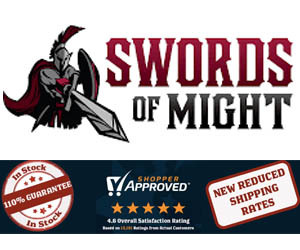 The marketing materials accompanying this sword are quite accurate when they say that the emphasis is placed on a razor sharp blade. This blade is seriously sharp  and the geometry is such that it is not just a thin blade but rather a very nicely done tapering to the edge. It passed a basic paper cutting test with flying colors, literally slicing into the paper upon touching it! Once I had got over its ridiculously sharp edge, reminiscent of considerably more expensive Hanwei Katana, I took a little time to take the rest of the blade in. 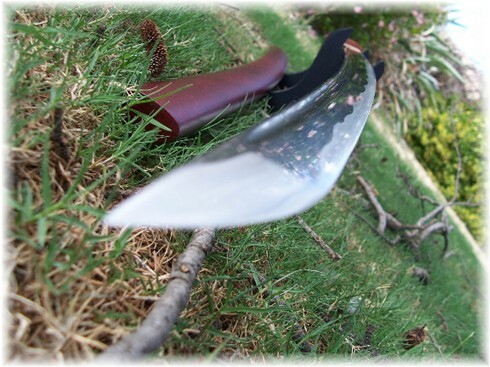 Naturally, this blade is not differentially hardened like true Japanese Samurai swords are. 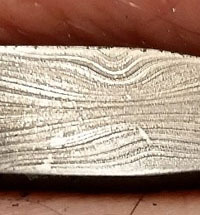 And as a result, the hamon or temper line is wire brushed, though quite fine and not unattractive. 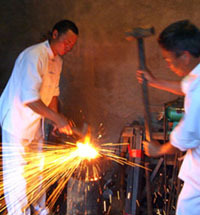 The Kissaski or tip of the blade is very nicely finished and flows cleanly into the rest of the blade. A quick flex test revealed an even and resistant temper, which was largely to be expected (or at least hoped for) with this monosteel sword. And overall, especially considering the $59 price tag, to say I was impressed with this blade was an understatement. At first, I was a little hesitant to do any cutting tests with this blade. 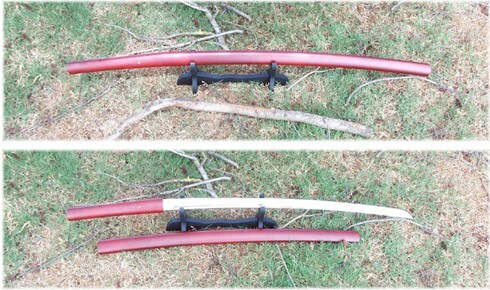 For safety reasons, it is recommended that any Japanese Samurai swords in Shirasaya be used primarily for display and storage rather than off the shelf cutting practice. Obviously, sweaty hands can make the grip on the hardwood handle precarious. And thrusting into an unforgiving target, without a hand guard to stop the hands from slipping on the blade (especially such a sharp blade as this one) would clearly be disastrous. 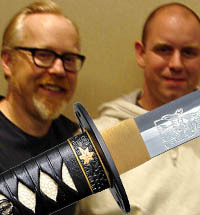 Now I already knew that this Japanese Samurai Swords edge was scary sharp. And after giving it all a good once over, I was confident that the blade was properly tempered. 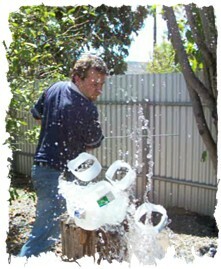 I lined up the target, and with the sunlight playing on the blade, my first cut sailed through the tops of the four milk jugs much as I expected. 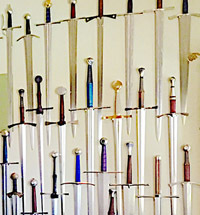 All the jugs remained where they were, which indicated that the blade did not push at all  it just cut wherever it touched and kept going on its way. A second cut followed suit, with almost exactly the same result (indeed, on both cuts, the severed top of the first jug cut would land in the same position)  suggesting that it was quite a consistent cutter so far. 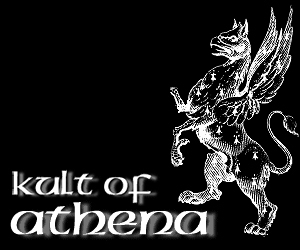 So far so good, it was time to consider my next target. Bamboo is an excellent target for evaluating how clean a given Japanese Samurai Swords cut is, as well as if the edge will chip against the relatively hard edge. 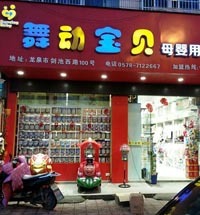 After all, many cheap Japanese Samurai swords are made with an edge that is too thin and sharp for its own good. It really is a shame that this Japanese Samurai Swords blade does not come mounted in traditional fittings. Naturally, for $59, it would be a bit of an ask as my tests reveal that the bare blade alone could easily fetch twice this price and still be a good deal. 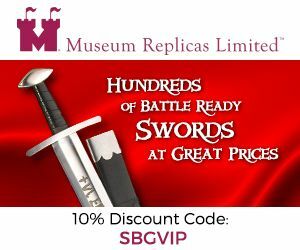 But as a cool display sword that can also be VERY CAREFULLY used for occasional light cutting  or better still a DIY project piece  this blade is an absolute must have in any budget collection of Japanese Samurai swords. 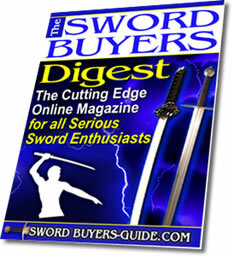 The best place to buy these swords is Trueswords.com where they are available here for the bargain price of $59.